IT MAY BE SAFE TO SAY THAT WITH UNEMPLOYMENT affecting New Yorkers across the financial spectrum, this year’s Brooklyn Public Library PowerUP! entrepreneurial competition will receive even more applications than last year’s record number. If you are 18 years of age or older, live in Brooklyn, are a legal resident or U.S. citizen and wish to start a business in Brooklyn, you are eligible to apply. Three winners will receive cash awards to build from their business plans. All applicants must attend one orientation, which will give the details about applying to PowerUP! You may register online or by phone after March 9. 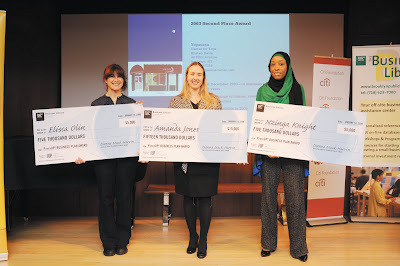 On Jan. 14, last year’s winners were announced at the Business Library’s Fifth PowerUP! Award Ceremony. AMANDA JONES, owner of Brooklyn Fudge, took the $15,000 first prize, and NZINGA KNIGHT of Nzinga Knight International and ELISSA OLIN of Green Home, Green Living each received second place and $5,000. Knight hopes to create “stunning, yet modest, dresses” that will appeal to “glamorous women who want to be elegant but not exposed, and in particular, to Muslim women who are both chic and affluent.” Green Home Green Living is a small “green” one-stop retail shop to solve that dilemma. It will sell everything to environmentally friendly items from personal care products, to pet food, to children’s toys, which will be identified and labeled as organic, natural, sustainable or free trade. • Tuesday, March 29, 6-7:30 p.m.
• Tuesday, April 14, 6-7:30 p.m.
• Thursday, April 23, 9-10:30 a.m.
• Tuesday, April 28, 6-7:30 p.m.
BROOKLYN RESCUE MISSION BED-STUY FARM has been named by Natural Home magazine as one of the top 10 urban farms in the country for providing food for the Brooklyn Rescue Mission food pantry and educating youth, through cooking demonstrations, nutrition classes and more. The vacant lot, once a veritable garbage dump, was transformed into an “urban oasis,” a community gathering space and a classroom to teach neighborhood youth about food growing and community service. In 2008 the farm began participating in community-supported agriculture; the farm also sells its fresh produce at the Malcolm X community farmer’s market. Co-founders of the Brooklyn Rescue Mission, Rev. ROBERT JACKSON and Rev. DEVANIE JACKSON, are also co-chairs of the Brooklyn Food and Fitness Task Force and members of Brooklyn’s Bounty, a collaboration of farmer’s markets and community gardeners.